A substantial proportion of pathological gamblers engage in gambling‐related illegal behavior. We examined differences in baseline characteristics and treatment outcomes in two groups: pathological gamblers who did and did not commit gambling‐related illegal acts in the year before treatment. Participants were 231 pathological gamblers enrolled in a randomized study of treatment that included cognitive behavior therapy and referral to Gamblers Anonymous (GA). Participants reporting recent illegal behavior (n = 63) endorsed more severe lifetime and recent (past‐year) gambling disorder symptoms and higher gambling‐related debt than did gamblers who denied illegal behavior (n = 168). Those who reported illegal behavior also maintained a significantly higher severity of gambling disorder throughout treatment, although both groups experienced similar improvements in gambling symptoms over time. While pathological gamblers with or without gambling‐related illegal behavior appeared to improve at a similar rate regardless of the treatment provided, more intensive treatment may be warranted for individuals with gambling‐related illegal behavior, as they demonstrated greater gambling severity throughout treatment and follow‐up. Pathological gambling (PG) is an impulse‐control disorder characterized by excessive gambling. Approximately 0.4 to 1.6 percent of the American adult population have had the disorder.1,2 According to the American Psychiatric Association's most recent edition of the Diagnostic and Statistical Manual of Mental Disorders (DSM‐IV‐TR), a diagnosis of PG is made if an individual has five or more of the following symptoms: preoccupation with gambling, needing to gamble increasing amounts of money to maintain excitement, unsuccessful attempts to quit or reduce the amount of gambling, restlessness or irritability when gambling is reduced, use of gambling to escape from emotional problems, chasing (gambling to recoup) losses, lying to others to hide the extent of gambling, engaging in illegal activities to fund gambling, placing jobs or relationships in jeopardy, and asking family or friends to relieve desperate financial situations caused by gambling.3 PG is frequently associated with financial, vocational, interpersonal, and psychiatric problems.4 Some gamblers also experience substantial legal problems related to gambling. Gambling‐related illegal behavior typically includes fraudulent financial dealings, such as embezzlement, theft, writing bad checks, and surreptitious use of another person's credit. Such crimes are frequently committed in desperation, either to cover up financial damage from gambling‐related losses or to fund further gambling sprees. Illegal activities may intensify the severity of gambling‐related problems. For example, gambling‐related illegal acts may result in arrest and incarceration. Potenza and colleagues5 found that more than 11 percent of callers to a Connecticut gambling help line reported at least one prior gambling‐related arrest. A recent review of studies of inmates from several countries reported that approximately one‐third of individuals in correctional settings are problem or pathological gamblers.6 In U.S. prisons, the prevalence of PG varies based on assessment modality and the specific measure used, but ranges from 5 to 38 percent.7–9 About 50 percent of incarcerated men and women with PG in two New Zealand studies reported committing crimes to support their gambling.10,11 Most of these were nonviolent crimes including theft, fraud, burglary, shoplifting, and drug offenses. Gambling‐related illegal behavior tends to occur mostly in individuals with severe PG and less frequently in individuals with milder forms of the disorder. Toce‐Gerstein and colleagues,12 for example, found that only 2.2 percent of individuals with less severe PG (i.e., 5 to 7 DSM‐IV symptoms) reported engaging in gambling‐related illegal behavior, compared with 61 percent of individuals with severe PG (i.e., 8 to 10 DSM‐IV symptoms). It is important to understand the differences between those with and without recent gambling‐related illegal behavior when they present for treatment. We assessed the rate of gambling‐related illegal behavior among pathological gamblers in the year preceding entry into outpatient treatment. Pathological gamblers who had engaged in recent (i.e., past year) gambling‐related illegal behavior were compared with those who had not, on several baseline demographic and gambling‐related factors. We expected that pathological gamblers with recent illegal behavior would experience more severe gambling and psychosocial problems. We also examined whether participants with and without a history of gambling‐related illegal behavior receive differential benefits from gambling treatment. To this end, we examined within‐treatment and long‐term changes in the severity of the disorder. Because illegal behavior is associated with greater severity, we anticipated finding that pathological gamblers with or without illegal behavior would benefit from treatment equally, but that those with illegal behavior would continue to experience greater gambling problems even after undergoing treatment. Such a finding may suggest the need for more intensive treatment approaches for gamblers who engage in illegal behavior to support gambling. Participants were recruited through general media announcements (i.e., radio and newspaper advertisements) for a randomized clinical trial of cognitive behavioral treatment (CBT) for PG (described later in the article and in Ref. 15). Inclusion criteria were a current DSM‐IV diagnosis of PG, gambling in the past two months, age 18 years or older, and ability to read English at fifth‐grade level or higher. Exclusion criteria were current suicidal intent, psychotic symptoms in the past month, and current treatment of gambling disorder elsewhere. In total, 231 participants were randomized to one of three treatment conditions (described later). The study was approved by the Institutional Review Board of the University of Connecticut School of Medicine, and each participant provided written informed consent before participation. Because of the sensitivity of the information (e.g., gambling behavior, illegal activities, and drug use), participants were informed that all of their responses would remain confidential, their questionnaires would be stored in locked file cabinets according to code numbers rather than their names, and only authorized individuals would have access to their data. Assessments were conducted at baseline, at 1 month of treatment, at the end of treatment (2 months), and at 6 and 12 months. Participants were compensated $15 for the 1‐ and 12‐month interviews, and $20 for the 2‐ and 6‐month interviews. For purposes of the current study, the baseline, post‐treatment, and final (either 6‐ or 12‐month) assessments were examined in detail. Participants were asked to provide age, gender, marital status, racial and ethnic identification, number of years of education, current employment status, and yearly income. They were asked if they had engaged in any of several illegal acts in the past year, including stealing, parole or probation violations, drug offenses, forgery, assault, arson, prostitution, writing bad checks, unauthorized use of someone's credit card, traffic violations, and embezzlement. Participants who reported engaging in any of these acts were also asked whether the offense led to an arrest and whether the act was related to his or her gambling. Participants also completed an antisocial personality disorder (ASPD) checklist that was based on DSM‐IV symptoms.3 They were classified as having ASPD if they met criteria for both childhood conduct disorder and adult ASPD. The SOGS is a 20‐item measure of pathological gambling based on DSM‐III diagnostic criteria.16 The convergent validity and reliability of the SOGS has been established.16–18 Baseline SOGS scores were obtained for the 30 days before entering treatment. At the post‐treatment and the 6‐ and 12‐month follow‐ups, SOGS scores were also obtained, and they covered the period since the most recent follow‐up assessment (i.e., the past 2 months at the post‐treatment evaluation, the past 4 months at the 6‐month evaluation, and the past 6 months at the 12‐month evaluation). The SOGS does not explicitly assess gambling‐related illegal behavior and thus was considered appropriate to use as an index of gambling symptom severity between individuals who do and those who do not display such behavior. The ASI‐G is a measure of the severity of problem gambling that has been developed as a supplement to the traditional Addiction Severity Index.19,20 Unlike the SOGS which relies on determination of gambling problems through symptom counts, the ASI‐G calculates severity based on actual gambling behavior, including days engaged in gambling and amount of money wagered in the past month. The ASI‐G has demonstrated adequate reliability and validity in pathological gamblers.21 The items that make up the ASI‐G score do not address gambling‐related illegal behavior. Treatment is described fully by Petry and colleagues.15 Briefly, after the baseline interview, each participant was randomly assigned to one of three treatment conditions: Gamblers Anonymous (GA) referral, GA referral plus a CBT workbook, or GA referral plus eight sessions of individual CBT. Participants in the GA‐only and GA‐plus‐workbook condition met with a research assistant (RA) for a single session lasting 10 to 15 minutes, to explain their treatment condition and recommendations. All participants were given a list of local GA meetings and were encouraged to select a GA meeting to attend. The workbook participants were also given a 70‐page workbook that included several exercises and a section on handling gambling‐related debt. The RA advised the participant to complete an exercise per week for eight weeks. Participants assigned to individual CBT also received a referral to GA, and they met with a study therapist for eight weekly 50‐minute sessions of individual CBT. The therapists were 10 masters or doctoral level clinicians. Therapy sessions and chapters of the CBT workbook covered identical topics and included: discovering triggers, functional analysis, pleasant activities, self‐management planning, coping with craving and urges, assertiveness and gambling‐refusal skills, irrational thinking, and coping with lapses. The content of the sessions is discussed extensively elsewhere.21,22 Participants were not randomized based on their self‐reported illegal behaviors and had an equal chance of being assigned to any of the three treatment conditions. Participants were grouped based on self‐reported history of gambling‐related illegal activity in the year preceding intake. Baseline differences on demographics, gambling variables, and ASPD, between pathological gamblers with and without a recent history of gambling‐related illegal behavior was then assessed. We used independent‐sample t tests or the Mann‐Whitney U test for continuous variables, depending on whether the dependent variable was normally distributed, and chi‐square analysis for dichotomous and categorical variables. To test differences in treatment outcomes, two repeated‐measures analyses of covariance (ANCOVA) were performed. In each analysis, the presence of gambling‐related illegal behavior in the past year (yes or no) and treatment group were included as independent variables. Age and ASPD diagnosis were added as covariates because the two illegal behavior groups (i.e., those who did and did not endorse illegal behavior) differed on these variables (Table 1). SOGS scores recorded at baseline, 2 months (the end of treatment), and the final follow‐up assessment completed by the participant at 6 or 12 months were the dependent variable in one analysis. ASI gambling scores recorded at the same time points were analyzed as the dependent variable in the other analysis. Complete follow‐up data were available for 171 participants, constituting more than 74 percent of the original randomized sample. For most participants (n = 158), the 12‐month follow‐up assessment was used in these analyses. The 6‐month follow‐up was substituted for 13 participants who did not complete the 12‐month follow‐up assessment. The remaining participants (n = 61) did not complete either the post‐treatment or the 6‐ or 12‐month follow‐ups and were not included in the analyses. There were no differences in follow‐up rates across treatment conditions, and there were no differences in the percentage of participants with or without illegal behavior (data not shown). However, participants who were excluded from further analysis because of incomplete data were significantly more likely to be men (31.5%) than women (19.2%; χ2(1, n = 231) = 4.47, p ≤ .05), and they tended to be younger than participants reporting no illegal behavior (age, 40.9 ±11.5 years versus 46.2 ± 10.3 years; t (229) = 3.37, p ≤ .05). Gambling‐related illegal behavior was fairly common in the sample, with 27.3 percent (n = 63) reporting at least one gambling‐related illegal act in the year before entering treatment. Most of the illegal behavior involved fraudulent financial dealings, such as writing bad checks (19.0%, n = 44), stealing (5.2%, n = 12), unauthorized use of a credit card (4.8%, n = 11), forgery (2.6%, n = 6), or embezzlement (2.2%, n = 5). Gambling‐related traffic violations (2.2%, n = 5) and parole or probation violations (0.4%, n = 1) were also reported. Violent crimes, such as assault or arson, were not represented among the gambling‐related illegal acts in the sample, nor were gambling‐related drug use or prostitution. Most participants with a history of gambling‐related illegal behavior (n = 48) reported engaging in only one type of crime, 12 reported engaging in two types, 2 in three types, and 1 in five types. Only five participants reported being arrested as a result of gambling‐related illegal behavior in the previous year. The arrests were for stealing (n = 2), embezzlement (n = 1), forgery (n = 2), and violation of probation (n = 1; one participant was arrested on two charges). Demographic differences between those with and those without recent gambling‐related illegal activities are presented in Table 1. The mean age of the sample was 44.9 ± 10.9 years. Pathological gamblers with a recent history of illegal behavior were significantly younger than those without. No other significant demographic differences were noted. Baseline gambling‐related variables are also presented in Table 1. Participants with a recent history of gambling‐related illegal behavior scored significantly higher than those without on both lifetime and past‐30‐day versions of the SOGS at intake. Those with a recent history of illegal behavior also reported significantly greater gambling debt than did pathological gamblers without a history of illegal behavior. Gamblers reporting illegal behavior were also more likely to meet criteria for ASPD. Overall, SOGS scores decreased from baseline to post‐treatment and follow‐up (p < .001). Further, overall SOGS scores were significantly greater in those with illegal behavior than in those without (p < .001). A significant time/treatment condition interaction was also noted (p < .05), with participants in CBT showing greater declines over time than those in the GA referral condition. However, there was no significant interaction between illegal behavior and treatment condition over time (p = .63). The main effects for time and illegal behavior are illustrated in Figure 1A . All other main effects and interactions were nonsignificant (all p > .05) as shown in Table 2. Changes in South Oaks Gambling Screen (SOGS) score (A) and Addiction Severity Index (ASI) gambling composite score (B) throughout the study of gamblers with or without gambling-related illegal behavior. As with the SOGS, ASI‐G scores decreased significantly over time (p < .001). 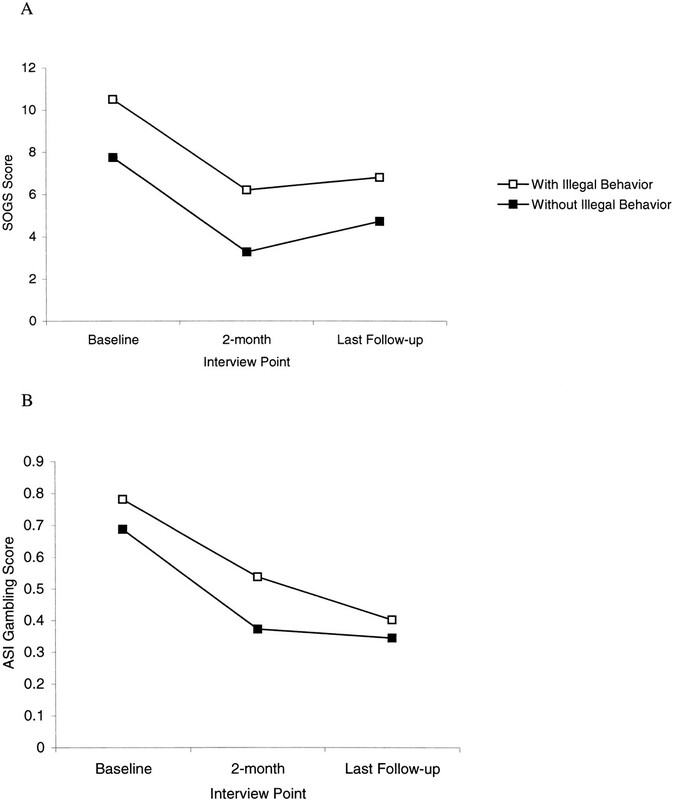 ASI‐G scores of participants with a history of gambling‐related illegal behavior were also higher on average throughout the treatment and follow‐up periods compared with the scores of the group without illegal behavior (p = .001). The illegal behavior/time interaction did not quite reach statistical significance (p = .055; Fig. 1B). There was no significant interaction between illegal behavior and treatment condition over time (p = .39). A significant time/age interaction was noted (p < .05). Younger participants experienced greater reductions in ASI‐G scores over time than did older participants. Other main effects and interactions were not statistically significant (all p > .05) and are noted in Table 3. The present study extends previous research on gambling‐related illegal activities as they relate to the severity of the gambling disorder, and it is the first study to examine the role of illegal behavior in predicting treatment outcomes among treatment‐seeking pathological gamblers. We found that a higher proportion of our participants reported engaging in gambling‐related illegal behavior (27.3% in the past year) than in recent epidemiological studies.12,13 In those studies, which showed lifetime illegal behavior rates of 14 to 19 percent, investigators identified pathological gamblers through random‐digit sampling from the general population by epidemiological methods. The current study was conducted among treatment‐seeking pathological gamblers, who probably differed from the persons in the epidemiological samples in several ways. Participants in our study may have had relatively severe gambling problems that led them to seek treatment. Thus, these data may be consistent with the finding of Toce‐Gerstein and colleagues12 who found that more than 60 percent of individuals with severe PG reported lifetime gambling‐related illegal behavior. We also found that pathological gamblers with gambling‐related illegal behavior experienced more severe gambling symptoms than did participants who did not report illegal behavior. Although we assessed only past‐year gambling‐related illegal behavior, groups differed on both lifetime and recent (e.g., past year) gambling disorder severity. Consistent with prior research,5 individuals with gambling‐related illegal behavior also experienced greater gambling debt. We did not find significant differences in some other gambling severity variables, such as age at the first gambling episode, and amount of time and money spent gambling. We did not find significant gender differences in the rates of gambling‐related illegal behavior. Some prior studies have found that men are more likely than women to engage in such behavior (e.g., Ref. 23), but this finding is not universal.24 Potenza and colleagues25 indicated that the women who called a gambling help line were more likely to report illegal behavior without arrest than were the male callers (15.4% versus 6.7% lifetime), but that the men were more likely to report gambling‐related arrest than were the women (15.6% versus 6.0% lifetime). In the present study, only five participants reported a gambling‐related arrest in the year preceding treatment. Finally, the gambling disorder of pathological gamblers reporting illegal behavior declined with treatment at a rate similar to that of those who denied recent gambling‐related illegal behavior; however, the level of severity of gambling disorder throughout treatment and the follow‐up period remained elevated in those admitting to compared with those denying illegal behavior. As demonstrated in Figure 1A, pathological gamblers with gambling‐related illegal behavior, as a group, never achieved a period when the mean number of gambling symptoms went below five, which is the number of symptoms generally accepted as the cutoff for a classification of PG on the SOGS. On average, these individuals remained at a pathological level with regard to their gambling throughout the study period, while symptoms for those who did not engage in illegal behavior declined to subthreshold levels. Thus, pathological gamblers who engage in gambling‐related illegal behavior may benefit from treatments of greater duration or intensity. Future research is needed to investigate this possibility. The original analysis of the primary outcomes of this efficacy study revealed that individual CBT resulted in significantly reduced gambling during the treatment period compared with GA referral alone, and some differences were also noted throughout the follow‐up periods.15 Individual CBT also resulted in significantly greater improvement in some outcome variables than did the CBT with workbook treatment. The present analysis revealed that pathological gamblers with and without gambling‐related illegal behavior did not experience differential improvement on the basis of treatment condition. That is, both groups (with and without illegal behavior) improved similarly within their assigned treatment condition, a finding that is consistent with the overall study outcomes. More research is needed to understand the mechanisms that lead to gambling‐related illegal behavior. Perhaps the most relevant is the role of impulsiveness. Previous research on pathological gamblers has addressed relationships between illegal behavior, impulsiveness, and antisocial traits.24,26–28 Leblonde and colleagues,29 for example, found that pathological gamblers who are highly impulsive are more likely to experience treatment failure than those who are low in this trait. Additional research may reveal more direct relationships between impulsiveness and gambling‐related illegal behavior. Gambling‐related debt was also associated with illegal behavior, with higher debt correlating with involvement in illegal behavior. Financial pressures may be related to the decision to engage in illegal behavior and is another possible subject for future research. A significant limitation of the current study is that we assessed only past‐year, rather than lifetime, gambling‐related illegal behavior. Assessment of lifetime illegal behavior would likely result in a greater proportion of gamblers who acknowledge engaging in such behavior to support gambling. Another limitation is that we studied only treatment‐seeking pathological gamblers. Therefore, the present findings may not generalize to pathological gamblers recruited from the community, those who are unmotivated to reduce their gambling, or those who recover without treatment. Finally, confirmatory sources were not available to determine whether participants were accurately reporting gambling‐related illegal behavior. Future studies should consult other sources of information (e.g., family, friends, or court records) to confirm self‐reported data. Despite the limitations, this study has implications for treatment and for further study. Pathological gamblers who engage in gambling‐related illegal behavior experience more severe symptoms, and these symptoms remain elevated throughout treatment. Thus, these individuals appear to experience worse outcomes than do those who do not engage in illegal behavior. More research is needed to address the adequacy of current treatments and the role of gambling‐related illegal behavior in gambling severity, treatment failure, and relapse.